Play Pretend is designed to capture the vivid and limitless world of a child's imagination. Play pretend is such an important part of being a child; with an active imagination, even a simple cardboard box can provide hours of entertainment. This collection's bright colors and whimsical elements are perfect for keeping record of all the make-believe, storytelling, and creativity you and your children engage in. 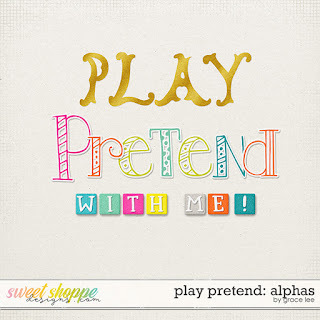 Play Pretend: Bundle includes the kit, alphas, extra papers, and journal cards.